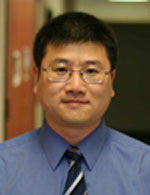 Qiang Lin received his BS and MS in Applied Physics from Tsinghua University, China, in 1996 and 1999, respectively, and received his PhD from Institute of Optics, University of Rochester, in 2006. He was a postdoctoral scholar in the Department of Applied Physics at Caltech from 2007 to 2010. In 2011, he joined the faculty of electrical & computer engineering and the faculty of optics, as an assistant professor. Professor Lin's general research interests focus on understanding the fundamental physics of novel nonlinear optical, quantum optical, and optomechanical phenomena in micro-/nanoscopic photonic structures, and on finding their potential applications towards chip-scale photonic signal processing in both classical and quantum regimes.